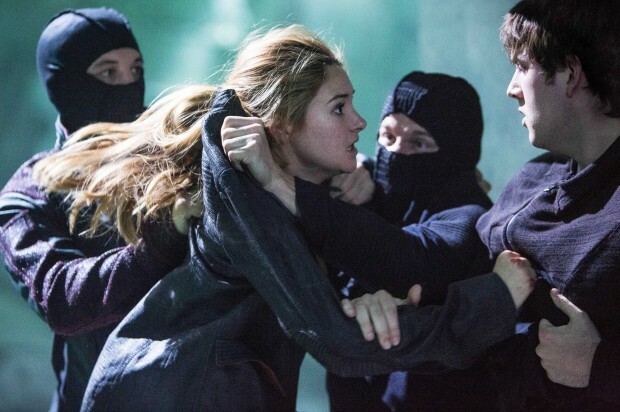 This publicity photo released by Summit Entertainment shows Shailene Woodley, left, and Christian Madsen in a scene from the film, "Divergent." During the Sunday broadcast of MTV&apos;s 2013 Video Music Awards, "Divergent" stars Shailene Woodley and Theo James introduced an exclusive first look of their new film: an action-adventure set in a future world where people are divided into factions based on their personalities, and one young girl— labeled "Divergent"—who must start a revolution in order to survive. Although the footage was not quite exciting enough to steal Miley Cyrus&apos; twerking thunder, it still worked as a visceral combination of new and familiar. The sneak peak showed a cutthroat, Orwellian universe akin to "The Hunger Games," but with cherub-cheeked Woodley playing the Jennifer Lawrence girl savior role of Tris Prior and Kate Winslet playing the villain, Erudite faction leader Jeanine Matthews. "Divergent," set to hit theaters nationwide on March 21, 2014, is based on the debut best-selling novel of the same name by 25-year-old Barrington, Il. native and Northwestern University alumnus Veronica Roth. Like "Hunger Games" author Suzanne Collins, Roth has written her popular sci-fi saga as a trilogy of young adult novels: "Divergent," "Insurgent" and "Allegiant." The third book will be published on October 22, and Summit Entertainment already holds the film rights to the second. But while the post-apocalyptic world of the "Hunger Games" bears hardly any resemblance to the one we live in today, the similarly dystopian "Divergent" boasts a very distinctive backdrop: a futuristic version of Chicago. The film&apos;s cast and crew just finished shooting here this summer, heading out just in time for "Transformers 4" to step in. After just a couple of months in pre-production and approximately 60 days of principal photography on location, the "Divergent" shoot brought nearly $30 million to Chicago&apos;s economy and created over 1,000 local jobs. In the highly-anticipated first trailer, Woodley&apos;s plucky heroine Tris scales a CGI-enhanced ferris wheel at Navy Pier, leaps from what appears to be an El train and plummets off a ledge overlooking the Second City. Ignore a not-so-fresh premise and clunky truisms like "the future belongs to those who know where they belong,"(even Oscar-winner Winslet can&apos;t make that line work), and "Divergent" has all the makings of a home-grown hit. Still, I wonder: will the film be able to transcend comparisons and succeed on the same level as young adult book-to-film franchises "Harry Potter" and "The Hunger Games," or flop disastrously by not being able to hold a candle to its predecessors? Even the name of Woodley&apos;s character is eerily similar to that of her "Hunger Games" rival (Tris, Katniss), but she insists that the two franchise heads and archetypal chosen girls couldn&apos;t be more different. "What I like about Tris is that she isn&apos;t perfect, she&apos;s not a superhero—she&apos;s not Katniss," Woodley told Entertainment Weekly, "She doesn&apos;t know how to shoot a bow and arrow, she&apos;s not a badass by nature." Perhaps the tender vulnerability that Woodley has brought to her most critically-acclaimed roles thus far (rebellious daughter of George Clooney in "The Descendents," bookish girlfriend of "Divergent" co-star Miles Teller in "The Spectacular Now") will also give Tris an even more relatable presence for film audiences than she garnered on the page. But will Winslet, best known for playing the love-struck Rose in "Titanic" and winsome Clementine in "Eternal Sunshine of the Spotless Mind," register as a convincing villain? Maybe I&apos;m a bit biased in saying this, but at least I know one thing for sure: the Chicago set pieces will be fantastic. Are you looking forward to seeing a dystopian Chicago in "Divergent?"